Bardarbunga (Central Iceland): The eruption at Holuhraun continues at similar levels as lately, the Icelandic Met Office reports in its updates. 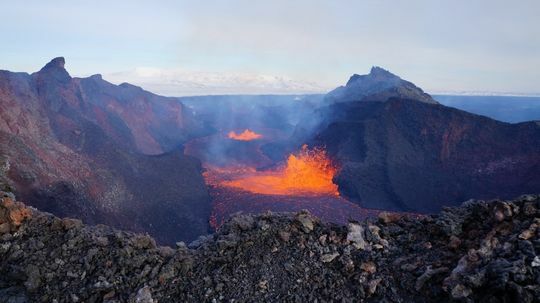 The decreasing trend, however, is becoming visible in a significant drop of the lava lake level inside the Baugur crater above the main vents, seen in the photo above. "From the field 12 Feb 2015; view from the rim of the southern crater into the lava lake of Baugur. In the foreground, 400m away from the rim, is the southern magma vent. Beyond that there is the northern magma vent, boiling. The lava lake in the foreground is not only glowing; the blackish cover next to the rim indicates some cold crust on its surface, whereas the orange colour reveals liquid magma. Photo: Ármann Höskuldsson. See more photos in a field report from the Institute of Earth Sciences" (Icelandic Met Office). Kliuchevskoi (Kamchatka): A stronger phase in the ongoing eruption produced an ash plume that rose to 23,000 ft (7 km) last night (Tokyo VAAC). Shiveluch (Kamchatka): Kamchatka's most active volcano continues to produce ash plumes as well, generated by explosions at the dome as well as avalanches from it - Tokyo VAAC reported ash to 19,000 ft (5.4 km) altitude yesterday. Zhupanovsky (Kamchatka, Russia): Intermittent explosions and ash emissions continue. Last night Tokyo VAAC reported a plume to 20,000 ft (6 km) altitude drifting west. Chikurachki (Paramushir Island): A strong explosive eruption occurred from the volcano on Paramushir island last evening, producing an ash plume that rose to 25,000 ft (7.5 km) altitude and drifted quickly west, already more than 200 km distance. The Aviation Color Code was raised to red. Aso (Kyushu): No significant changes in the ongoing mild eruption have occurred over the past weeks. Small ash emissions from strombolian activity inside Nakadake crater are near continuous. Suwanose-jima (Ryukyu Islands): Strombolian activity from On-take's crater continues to be on the higher end of the average scale and produces small ash plumes. Sinabung (Sumatra, Indonesia): Following the large pyroclastic flow on 9 Feb, several smaller to medium ones have occurred over the past days. It is difficult to be sure, but it suggests that lava effusion to the steep viscous lobe on the upper steep flank is currently at a higher rate than during most of the past months. Popocatépetl (Central Mexico): The volcano's activity remains more or less unchanged with fluctuating levels as to the number of emissions and explosions and seismic activity. After a peak in early February with up to 60 events, the recorded number of daily explosions has stabilized to about 10 during the past few days. Ash plumes rose 1-2 km above the crater. Bright glow is visible from the crater at night, indicating arriving fresh magma in the inner crater where a new lava dome is forming. Seismic activity is low, although a peak in volcanic tremor occurred on 13 Feb with 600 minutes of weak volcanic tremor recorded. Piton de la Fournaise (La Réunion): After 10 days of relatively stable, mild effusive lava flow activity, the eruption seems to have ended last night.